Upcoming faith-based theatrical releases and new DVDs were front and center at ICRS, with retailers treated to screenings, trailers and DVDs, and celebrity signings. Producer and star of God’s Not Dead David A.R. White signed copies of the DVD with co-star Shane Harper on the floor and spoke about the film’s success at a breakfast event. To date, it is the No. 1 independent film of 2014, with the DVD released Aug. 5. Sony’s Affirm Films hosted retailers at a suite away from the convention center at the Omni Hotel, inviting them to screenings of its two upcoming theatrical releases, the supernatural horror thriller The Remaining, due out this fall, and When the Game Stands Tall, the story of the De La Salle Spartans high school football team and its legendary Coach Bob Ladouceur, played by Jim Caviezel and due in theaters Aug. 22. 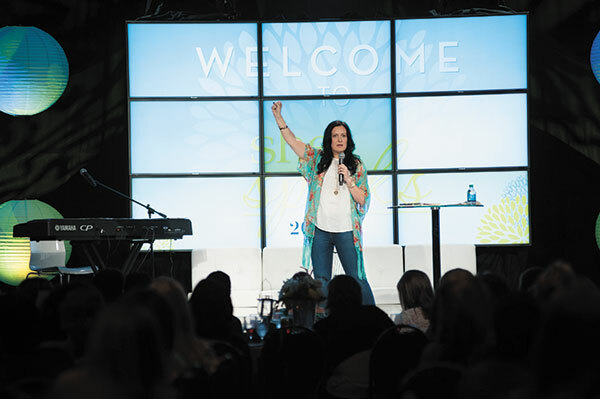 City on a Hill Productions invited key retailers to a private reception, followed by two convention-wide screenings of The Song, an adaptation of the Song of Solomon and Ecclesiastes. Richard Ramsey, Louisville, Kentucky-based screenwriter and director takes the biblical King Solomon and portrays him as a modern-day singer-songwriter who succumbs to sins of the flesh. Nashville-based actors Alan Powell (in the role of Jed King) and Caitlin Nicol (Shelby Bale) were on hand for the reception and screenings and played and sang the title track from the movie for an audience of several hundred. Small group curriculum and other church resources will release at the same time as The Song, which opens in about 400 theaters Sept. 26. Convention-goers also were invited to a public screening of One Media and Millennium Entertainment’s July 18 political thriller Persecuted, starring James Remar, singer Natalie Grant and former Senator Fred Thompson and written, directed and produced by Daniel Lusko. In the movie, a senator frames a popular evangelist for murder because he is standing in the way of sweeping religious reform. Life-sized images of actor Nicolas Cage greeted retailers on the exhibit floor, as he is starring in the fall remake of Left Behind, based on the blockbuster novel by Tim LaHaye and Jerry B. Jenkins. Producer Paul Lalonde and his brother Peter produced the original film that released 14 years ago, starring Kirk Cameron. Now Paul returns solo with Left Behind: The End Begins, also starring Chad Michael Murray and Jordin Sparks. The $16 million Oct. 3 release focuses only on the rapture. Suppliers and distributors hope that generating excitement for films will propel DVD sales, which can help offset the decline in music sales. Wells said that music still has some legs and pointed to the success of bands like For King and Country who performed Sunday. From Christian Retailing’s presentation of its product awards to the Christy Awards for Christian fiction, there was no shortage of honors presented at the 2014 International Christian Retail Show (ICRS). The Christian Retailing’s Best awards (christianretailingsbest.com) were announced Tuesday morning, June 24 at the Creative Pavilion stage. Todd Starnes, author of God Less America (FrontLine/Charisma House) and host of the “FOX News & Commentary” daily radio show, presented the awards. Abingdon Press was the runaway winner with 12 awards this year, including both Bible categories won by the company’s Common English Bible editions, one for author and pastor Adam Hamilton, and two—fiction and nonfiction—for Cynthia Ruchti. Tyndale House Publishers and Baker Publishing Group each took four awards. The winning authors from Tyndale were David Platt, Beth Moore, Karen Whiting and Ann Voskamp. Baker won in two fiction categories, one of which was a tie; Charismatic; and Bible Reference/Study. The company’s winning authors included Dani Pettrey, Beverly Lewis, James W. Goll and Tremper Longman III (editor). At the 15th annual Christy Awards on Monday evening, June 23, Lori Benton was honored with three awards for the best in Christian fiction. Not only was Benton’s Burning Sky: A Novel of the American Frontier (WaterBrook Press) given the top honor as Book of the Year, but the title also won in the First Novel and Historical categories. Benton was not able to attend, however, for health reasons. Benton is only the second debut novelist to receive the Christy Awards’ highest honor. Davis Bunn was master of ceremonies for the awards, held at the Atlanta Marriott Marquis. With four of his works Christy winners in past years, Bunn was inducted into the Christy Hall of Fame. Marcia Z. Nelson, Publishers Weekly’s associate religion editor, was keynote speaker. Bible publishers at the International Christian Retail Show were helping Christian retailers capitalize on their uniqueness in the marketplace with new Scripture offerings. Passio, an imprint of Charisma House, brought the only new Bible translation—the Modern English Version (MEV)—while multiple companies varied their Scripture offerings with new approaches and styles. Charisma House came to the show in a big way, bringing a tour bus that not only featured Todd Starnes’ book God Less America, but also the MEV Bible, releasing this fall. Just before ICRS, B&H Publishing Group announced its plans for The Rainbow Study Bible, the best-selling color-coded, themed Bible acquired from Standard Publishing. Launching in September, the Holman Rainbow Study Bible, KJV Edition features an all-new page layout that includes the unique color-code key across every spread. The NIV edition will release in February 2015, and then the RVR 1960 Spanish edition will follow in April 2015. B&H is also helping retailers maximize the effectiveness of their presentation of text Bibles. About a year ago, the company began to offer the KJV in a merchandising program with seven Bible sizes and 14 styles and designs. B&H is now rolling out the New King James Version (NKJV) in the same program, and from fall 2014 to spring 2015 will be doing the same with the Holman Christian Standard Bible (HCSB). Sharon Heggeland, director of sales operations, at Tyndale House Publishers, said that the company’s significant One Year Bible “anchor brand” has been refreshed with full-color imagery for each day’s reading. The One Year Bible Illustrated comes in the New Living Translation and the New International Version. Tyndale also introduced HCSB version of its popular Life Application Study Bible. Several publishers had women’s Bibles to promote, including B&H (The Study Bible for Women, HCSB), Charisma House (SpiritLed Woman Bible, MEV) and Crossway (ESV Women’s Devotional Bible, English Standard Version). HarperCollins Christian Publishing was promoting The Duck Commander Faith and Family Bible (Thomas Nelson, Oct. 28), continuing the popular brand, and the NIV First-Century Study Bible (Zondervan, Sept. 9), which guides the reader in Scripture study through the eyes of a first-century disciple. The 2014 International Christian Retail Show (ICRS) convened in Atlanta, June 22-25, with the number of attendees essentially flat, but with significant discussions on the future of Christian retail. The number of attendees at this year’s convention was essentially flat, with CBA reporting buyer attendance up 2.4%. In St. Louis last year, professional attendance for ICRS was down 15% to 1,485 buyers. Some exhibitors changed their strategy for the show, seeking to rein in costs. Gardenfire and African American Expressions (AAE) opted out, while InterVarsity Press (IVP) just had a table in the international rights area. “Knowing that CBA is attempting to right-size the event and its costs (much of which are borne by exhibitors), I wanted to pull way back and gauge the impact, knowing that IVP would return in 2016 and beyond when CBA’s legacy contracts with convention centers reflecting a very old set of realities were fulfilled and a new model was in place,” said Jeff Crosby, IVP’s associate publisher and director of sales and marketing. AAE Sales Manager Ron Gilmore said options are “still open” for 2015, but the company’s new approach didn’t pan out. Apparel maker Gardenfire, usually a big presence at the show, opted for a pair of gift marts this year, but plans to return to ICRS. Much of the planned discussion at ICRS focused on reaching millennials as the industry is seeing significant shifts in shopping habits and fluctuations in church attendance, especially in the 18-33 age group. In that session, the association presented Family Talk’s Dr. James Dobson with the ICRS Lifetime Achievement Award. “His radio interviews alone drove tens of thousands of people to Christian bookstores,” Riskey said. In addition to retailers and vendors, CBA tailored parts of ICRS to the public and to ministry leaders, the latter in conjunction with RBC Ministries. The new Change A Life Festival, free to the public, saw some big names, including Phil, Alan and “Miss Kay” Robertson of Duck Dynasty fame, and show-stopping band For King & Country. The festival benefited Buckhead Christian Ministry. Comedian and Hachette Book Group author Stephen Colbert stirred the publishing pot in June regarding an ongoing dispute between the prominent publisher and online giant Amazon. The bad blood centers around Amazon’s decision to delay the delivery of books, not list some e-books and not permit pre-sales. Hachette said negotiations with Amazon are continuing: “It is good to see Amazon acknowledge that its business decisions significantly affect authors’ lives,” a statement from the company said. “For reasons of their own, Amazon has limited its customers’ ability to buy more than 5,000 Hachette titles. “Authors, with whom we at Hachette have been partners for nearly two centuries, engage in a complex and difficult mission to communicate with readers. In addition to royalties, they are concerned with audience, career, culture, education, art, entertainment and connection. By preventing its customers from connecting with these authors’ books, Amazon indicates that it considers books to be like any other consumer good. They are not. Senior Vice President and Publisher Rolf Zettersten observed that Hachette Nashville’s “hottest-selling book” at the time was Instinct by T.D. Jakes, which Amazon has kept in stock. Literary agent Chip MacGregor observed on his blog (chipmacgregor.com/the-business-of-writing/biggest-news-bea/#disqus_thread) that the biggest topic of conversation at May’s Book Expo America in New York City was the Amazon-Hachette dispute. The fight is all about the bottom line, according to MacGregor. The online retailer added that the “business interruption affects a small percentage of Amazon’s demand-weighted units” and points to its third-party sellers for resolution. Family Christian Stores has hired Charles “Chuck” Bengochea as the retail chain’s new president and CEO. The former president and CEO of The Original Honeybaked Ham Company of Georgia, Bengochea began his new role with Family Christian on June 30. Bengochea comes to Family Christian with 35 years of successful business leadership. Following his 1979 graduation from Cornell University, Bengochea began to build his career working for General Electric, becoming an analyst in its television business division. In 1987, he joined The Coca-Cola Company and rose to the position of controller of the Fountain Business Division. Bengochea left Coca-Cola in 1995 to become the director of retail operations for The Original Honeybaked Ham Company of Georgia. In 2003, he was named president and three years later, CEO. Under Bengochea’s leadership, Honeybaked Ham of Georgia grew to 200 franchises and 115 company stores. Bengochea has been married for 37 years. He and his wife, Laurie, have four grown children. Bengochea is a triathlete and has completed in eight Ironman competitions. He recently served as chairman of the board of elders at Fellowship Bible Church in Roswell, Georgia. Jackson voiced the board’s gratitude for the outgoing president. “The board deeply appreciates the leadership provided by Cliff over these past 11 years,” Jackson said. “Cliff has expertly guided the organization during challenging retail times. He has strengthened the brand, improved operations and, most importantly, expanded the many ministries of Family Christian in changing lives across the globe. A capstone of Cliff’s many accomplishments at Family Christian is securing ownership of the company with stewards who are committed Christians and passionate about the mission of the company. Cliff has done a masterful job in establishing the company as a nonprofit ministry—the first of its kind in the country. The board and company are grateful for the strong leadership provided by Cliff. Jackson said the board was “blessed” to introduce Bengochea as head of the chain. Craft chain Hobby Lobby came out the victor in a 5-4 Supreme Court decision June 30. The long-awaited but narrow ruling for Oklahoma-based Hobby Lobby and for Pennsylvania-based Conestoga Wood Specialties fell in favor of the family-run businesses. The Affordable Care Act—commonly known as Obamacare—directs businesses to provide contraceptive coverage for their employees or face having to pay severe fines. The mandate does not allow businesses owned by Christians whose beliefs conflict with the law to forego providing coverage. Writing for the majority, Supreme Court Justice Samuel Alito delivered the opinion for the court in Burwell v. Hobby Lobby Stores and Conestoga Wood Specialties v. Burwell. The cases were consolidated before the Supreme Court. “Protecting the free-exercise rights of closely held corporations thus protects the religious liberty of the humans who own and control them,” he wrote. The court upheld a June 2013 ruling by the Tenth Circuit Court of Appeals protecting Hobby Lobby and the Green family from the Health and Human Services (HHS) mandate, which required the chain to provide and facilitate, against their religious convictions, four potentially life-terminating drugs and devices in the company’s health insurance plan. While the business provides other forms of contraceptive coverage through insurance, the Greens argued that the HHS mandate substantially burdened their religious beliefs in violation of the Religious Freedom Restoration Act. Lysa TerKeurst gladly admits she writes “from a place of my weakness.” Her struggles have yielded the best-selling Made to Crave: Satisfying Your Deepest Desire with God, Not Food and Unglued: Making Wise Choices in the Midst of Raw Emotions, which have reached sales of well more than 1 million copies, not including companion devotionals and participant guides. Her publisher, Nelson Books, an imprint of Thomas Nelson, which is part of HarperCollins Christian Publishers, is expecting more of the same from her August release, The Best Yes: Making Wise Decisions in the Midst of Endless Demands. The combination of Christian retailers and TerKeurst’s books are what Hampton calls the perfect marriage. “Lysa’s writing touches a broad audience, but the bull’s eye is exactly the kind of woman shopping in Christian retail: passionate about her faith, hungry for practical ideas and inspiration from an author who is authentic and knows from experience what it is like to juggle all of the roles she is playing,” he said. The New Life Bookstore, located inside New Life Church in Colorado Springs, Colorado, has a special place for TerKeurst’s books, according to Renai Herron, bookstore manager. Herron plans to promote The Best Yes in the bookstore newsletter and in the New Release section of the store, displaying it on an endcap and offering a 20% discount on purchases for groups. Baker Book House, an independent Christian retailer in Grand Rapids, Michigan, is forecasting store sales for The Best Yes on par with Made to Crave, which has sold nearly 700 copies since 2012, not counting Bible study guides. Baker Book House will highlight The Best Yes along with TerKeurst’s other best-selling books in displays near the front of the store and close to the registers. The store has purchased 280 copies and forecasts a sell-through and additional purchases, thanks in part to a “healthy, upfront discount” from Thomas Nelson. TerKeurst sees huge benefit from connecting to readers via Christian retailers. The Best Yes speaks directly to women who live with the stress of an overwhelmed schedule and an underwhelmed soul. The author, who is also founder and director of Proverbs 31 Ministries, and her husband have five children, ages 15 to 26, so they know about being rushed. In fact, TerKeurst had been praying for a couple of years that God would “unrush” her. She discovered that wedging one more event into her schedule could bring her to that place of overwhelmed stress. Hampton of Nelson Books sees TerKeurst as one of the few authors who will open their lives to their readers. He talked also of how much TerKeurst’s brand has meant to Nelson Books, admitting that he and his team learn as much from her as she learns from them. Hampton and TerKeurst are hoping for more of the same from Christian retailers who are eager to bring buyers through their store doors looking for her newest book. B&H Español received the Publisher of the Year award for the second year in a row at the Spanish Evangelical Publishers Association (SEPA) Awards Banquet on April 30. Held prior to the May 1-4 Expolit 2014 event in Miami, the awards banquet saw several publishers receiving book and Bible awards as well as honors for sales. A special award was given to Larry Downs Sr., manager of key accounts, Spanish sales at Thomas Nelson, for his 50 years of service and outstanding contribution to the Spanish Christian publishing industry. Downs oversaw a Peruvian bookstore, which grew into a distributor and then moved to Miami. He and Ralph Gates ran SAM Literature, later known as Libros International. Downs later worked for Editorial Vida and Editorial Unilit before joining Thomas Nelson in 2005. During the SEPA banquet, publisher B&H Español also won five awards for individual titles, including Best Specialty Bible and Best Cover and Interior Design (RVR 1960 Biblia del Pescador/RVR 1960 Fisher of Men). Editorial Clie took home two big prizes for Gran Diccionario Enciclopédico de la Biblia—Book of the Year Harold Kregel Award and Best Original Book in Spanish. Gary Chapman’s Los Cinco Lenguajes del Amor/The Five Love Languages won two Best-selling Book awards for Unilit, the first time a single title won trade- and pocket-size awards. Another classic by the publisher, Josh McDowell’s Más que un Carpintero/More Than a Carpenter, was added to the Galería de Honor for sales of more than 1 million copies. Casa Creación won for Leadership (John Maxwell’s Las 15 Leyes Indispensables del Crecimiento/The 15 Invaluable Laws of Growth), Christian Life (Joel Osteen’s Yo Declaro/I Declare) and Gift Book (John Eckhardt’s Declaraciones Diarias de Guerra Espiritual Para la Mujer/Women’s Daily Declarations for Spiritual Warfare). A significant new book tariff announced recently in Nigeria may not be enacted after all, adding just one more question for retailers and publishers doing business in a country experiencing its share of change, persecution and violence. Nigeria’s Minister of Finance Ngozi Okonjo-Iweala announced March 18 that the country was planning to impose a 62.5% tariff on imported printed books, according to Africaisacountry.com. The story went on to say that the tariff was approved in a ministry circular Feb. 28, but would apply retroactively from Jan. 1. That decision represented a departure from a UNESCO agreement signed 60 years ago in which officials agreed not to impose charges on imported books, publications and educational materials. Christian Booksellers Association Nigeria (CBAN) had some good news for Christian publishers, however. “Members of Christian Booksellers Association Nigeria who had shipments of Christian books and Bibles have not had to pay any tariff on their goods,” said CBAN National Administrative Secretary Charity Akinwunmi. The secretary said that CBAN officials have been in discussions with the government and have learned that the implementation of the new tariff has been suspended until Sept. 30. Akinwunmi also noted that retailers are seeing a distinction between how general interest and religious books and Bibles are being handled. In the meantime, the association advises that Christian books and Bibles should be shipped separately from educational and general interest books. Tyndale House Publishers is hopeful that his company’s trade accounts will not be affected by the substantial tariff. “Should the tariff be instituted, it would be a serious barrier to those in Nigeria who are to benefit most from the industry’s books and Bibles,” said James Elwell, Tyndale’s director of international publishing. Rick Heyer, international sales manager for Charisma House, also does business with Nigerian customers. Canada’s Christian retail landscape is experiencing a sea change. In the first six months of 2014, three major retailers in three large cities have closed or announced their plans to do so: Hull’s in Winnipeg, Manitoba, after 97 years in business; Speelman’s in Toronto after 52 years; and Cameron’s in Windsor, Ontario, after 52 years. The latest casualty, Cameron’s, was to close its doors June 14. The store was founded in 1962 in the basement of Glen and Dorothy Cameron’s home. “While we still consider the products that we sell to be life-shaping, the ‘local Christian bookstore’ is no longer the primary place to purchase them,” said Stuart Cameron, son of the store’s founders. Hull’s Family Bookstore shuttered two of its three stores in March. A 50% drop in customers prompted the Winnipeg store to close in March, one month after its Thunder Bay, Ontario, location closed. The Steinbach, Manitoba, store remains open. Hull’s remains optimistic that its “right-sized” location will re-emerge in the future. In February, the closure of Speelman’s Book House represents the end of a retail and a wholesale remainder business. A third stream that involves wholesaling Dutch-themed gifts, books and music will continue to operate. He noted that one challenge is that there are too many distributors serving a niche market. “There is far too much duplication which leads to additional costs being born by the retailer,” Hutchinson said. “Publishers can help Canadian retailers by feeding them the latest information on their products so they can buy wisely and give their Canadian distributors good margins so they can pass those on to stores,” said Lando Klassen, owner of House of James in Abbotsford, British Columbia. Although approximately 40 stores have closed in the last six years, some diversifying their product mix are finding success, Klassen said. For instance, Verses in Lloydminster, Alberta, has become the number-one Canadian outlet for Duck Commander merchandise. Christian Book and Music Center in Victoria reduced its rent by moving to a smaller location and added a coffee bar and clearance center. Faith Family Books & Gifts in Scarborough, Ontario, added a women’s clothing boutique to its 10,000-square-foot store. At the House of James, Klassen has increased sales by offering a used book center, general gifts, live music on the weekends, a coffee bar with an expanded menu and a summer reading club for kids.